Oh Hey There! : Jessicurl Oil Blend for Softer Hair. Jessicurl Oil Blend for Softer Hair. This stuff is amazing. I am probably far too enthusiastic about it and this probably isn't the best way to start a review but goddamn, I love it! 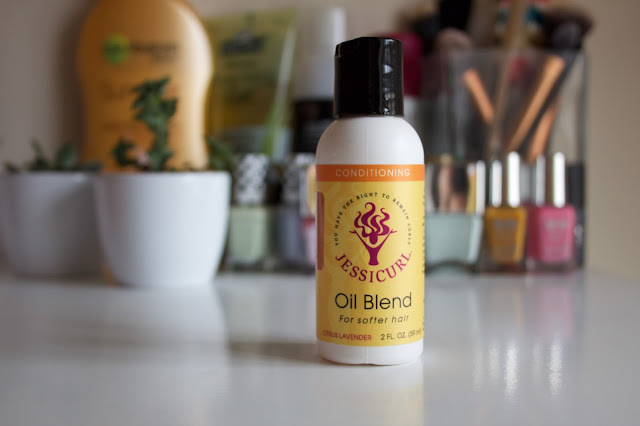 I have been using the Jessicurl Oil Blend for Softer Hair for about a month now and been frantically recommending it to everyone I know. My hair is in such good condition, really soft and shiny and the least frizzy it has ever been. It has become a firm staple in my haircare routine! It is a blend of around 7 different oils, including Avocado, Coconut and Grapefruit. I am not sure what it is about the blend but it works. I use about 6 or 7 drops on wet hair after my leave in conditioner. Using my fingers or my Tangle Teezer to distribute it. Most days I don't even use a styling product with it as it doesn't need it anymore. It feels really nice to use and smells amazing. Although I mostly use it on wet hair , I do sometimes use it on dry hair to smooth out any areas that need a bit of extra attention, usually just my ends. I think the most important thing about this product it that it has really improved the condition of my hair. Days when I don't use this product I still feel the benefits, it has definitely made it healthier! The only downside is the bottle is a little small. However you only need a few drops and even for my very long hair that is enough. I am so glad that I found this stuff and cannot wait to try more Jessicurl products in the future. I would especially recommend it for anyone, curly hair or not with damaged hair or trouble with frizz. I wish I had this product years ago! Have you tried any Jessicurl products?